Although plants and herbs might seem natural and safe, they can have potent effects. Trigonella foenum-graecum L.Leguminosae -- better known as fenugreek, a plant whose seeds and leaves have a long history of use in alternative medicine, could have several potentially serious effects on your unborn baby. Don't take fenugreek or any other herbal preparation when you're pregnant without first discussing it with your medical practitioner. Fenugreek is used in both Ayurvedic and Chinese medicine as well as throughout the Middle East. In addition to its medicinal use, some cultures also use it as a condiment or seasoning. Fenugreek can have a bitter taste and cause a peculiar body odor, somewhat like maple syrup. Fenugreek is also used as an alternative medicine to increase milk supply in breast-feeding mothers, although a review of studies published in the May 2013 issue of the "Journal of Human Lactation," the official magazine of the International Lactation Consultant Association, states that its effectiveness for this purpose has not been clinically proved. Scientists have not studied the effects of fenugreek in humans, due to the potential risks. However, neural tube defects such as anencephaly, the absence of part of the brain; spinal bifida, an abnormal opening in the spinal cord; or hydrocephaly have occurred in the fetuses of pregnant women taking this herb, according to a November 2013 "PLoS One" article. Animal studies have shown a risk to the fetus in women taking fenugreek during pregnancy. 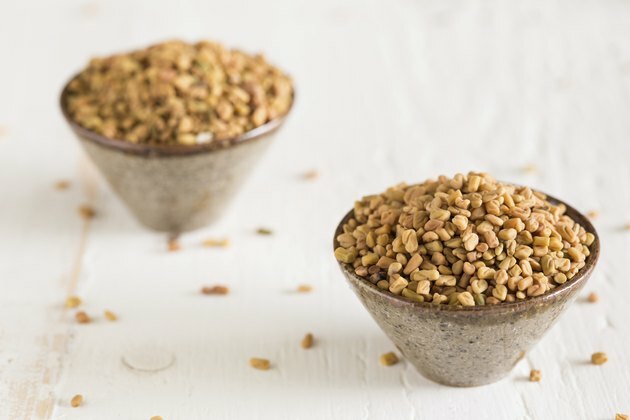 The same study found that mice exposed to fenugreek during pregnancy had neurobehavioral and sensorimotor defects after birth, including short-term memory defects, altered movement and coordination difficulties. Fenugreek has a history of use as an aid to labor and delivery in ancient Rome, according to an article published in the 2003 "Alternative Medicine Review." The same article states that early animal studies showed that fenugreek might cause uterine stimulation. This could lead to preterm labor or miscarriage if taken early in pregnancy. Do not take fenugreek to stimulate uterine contractions unless your medical practitioner recommends it. Fenugreek may lower blood glucose levels. If you have normal or low blood sugar, fenugreek could cause hypoglycemia, or low blood glucose. Symptoms of this condition include lightheadedness, dizziness, tremors, faintness and irritability. Fainting during pregnancy could lead to injury to the fetus or yourself. Fenugreek can cause allergic reactions; if you are allergic to chickpeas, you may also develop allergic symptoms from fenugreek. Fenugreek can also cause diarrhea and flatulence.